The cover of National Geographic Magazine in June of 1985, is in my subjective but educated opinion the worlds greatest Headshots Portrait captured by Steve McCurry. Gula’s village was attacked by a Soviet Union Helicopter that bombed her Village in Afghanistan and killed both of her parents, forcing her and her Grandmother to evacuate to Pakistan. Steve McCurry was rarely given an opportunity to photograph. 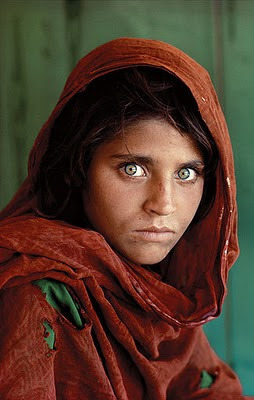 Picked up his Nikon FM2 camera, loaded with Kodachrome slide film and Nikkor 105 mm F2.5 lens and snapped two images of “The Afghan Girl”, while visiting the Nasir Bagh regugee camp in Pakistan. What makes this image the World’s greatest portrait? Often while I ask my students if they know the world’s greatest portrait. Some try to be witty, with a unique answer, but most don’t know the answer to my highly subjective question. Most believe that they would never recognize a photo portrait. When ever I explain to them that its the image of a 12 yrs old refugee girl, the cover of the National Geographic Magazine. They all know the image. There isn’t another portrait, besides the Mona Lisa which isn’t a Headhsot that will regnized. Look at her eyes. What do you see, look again? Do you see beautiful girls green eyes? Or do you see rage and anger. Its a encapsulated story of more than a thousand words. Perfect exposure, beautiful work of complementary colors. Her green eyes are eventuated by her vest and olive skin. A photographer with great abilities was at the right place, at the right time. This image launched a career, sold more National Geographic magazines. Filed under greatest portrait captured by Steve McCurry, The world most famous portrait headshots of all time.